I awoke this morning to claps of thunder, pouring rain and flashes of light so bright I first thought someone was shining a flashlight around my yard and over my windows. I had planned on sleeping in a bit, but I lept out of bed, donned my fuzzy white robe and threw open the sliding doors to both my bedroom and the living room to let that rain washed air flood the house. The first rain of autumn is a bit early this year, but it is more than welcome, as we are surrounded by forest fires and hopefully the rain will give those brave firefighters a little help! Another reason to jump for joy, soup weather! The very next thought was that with the rain comes cold and flu season. 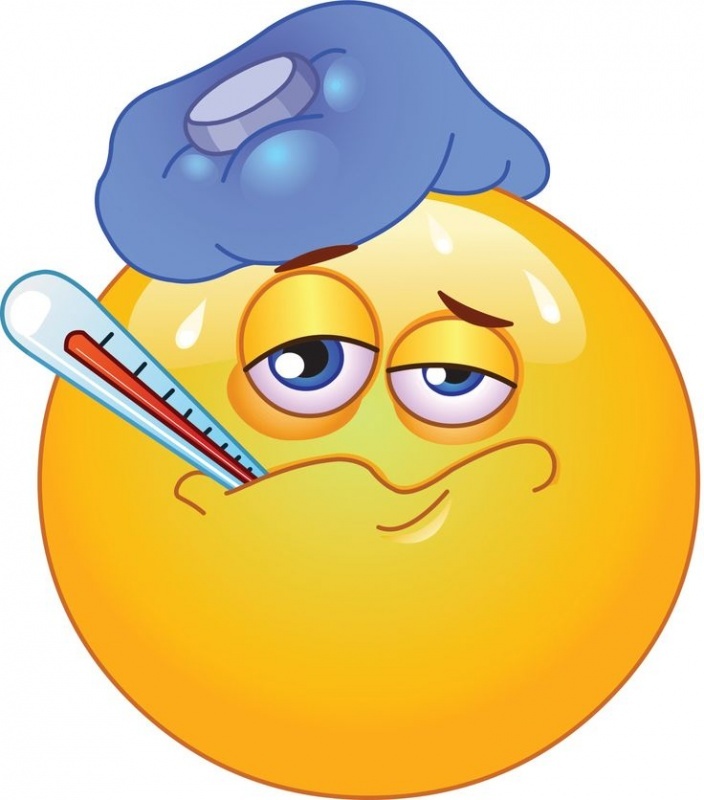 Kids start coming home from school with the sniffles, and before you know it, everyone in the house is sick. 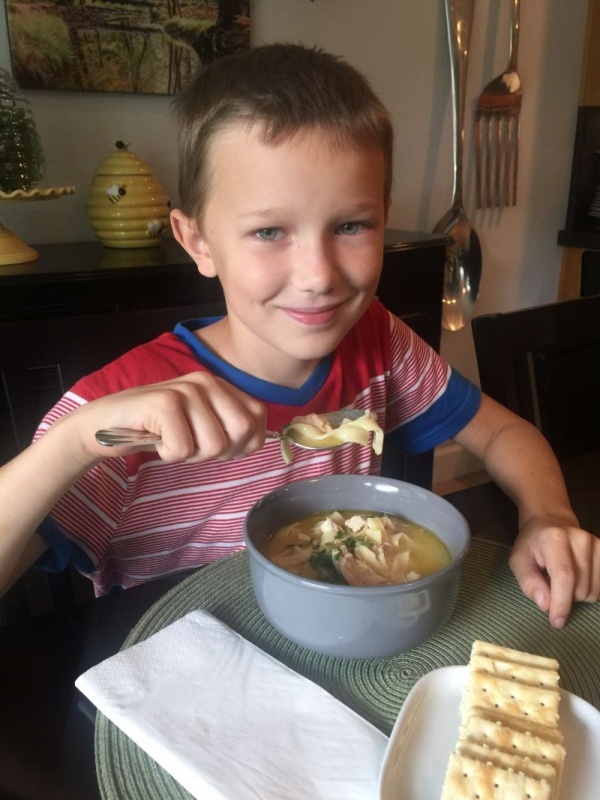 For me, that means I get to bust out my famous chicken noodle soup! Now before you turn up your nose, and scroll past this…read on just one more minute. 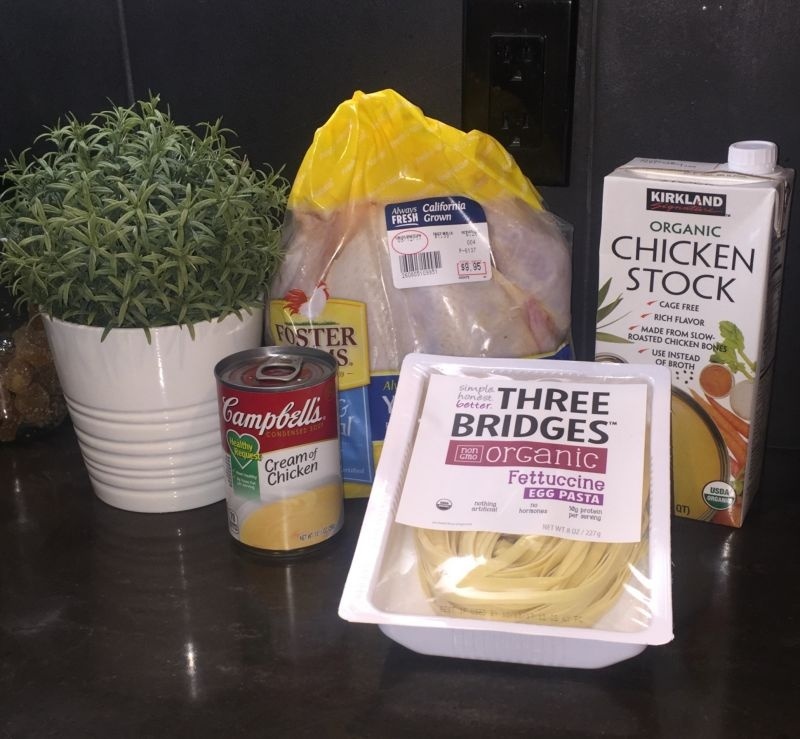 Not only is this the easiest chicken noodle soup you will ever make, it is by far the best you will ever taste! I honestly have friends call me when their family is sick, and ask me to bring over a pot full of this deliciousness! I was sitting listening to the rainfall, as it pounded on the lanai over our patio, and I got a text from my bestie. 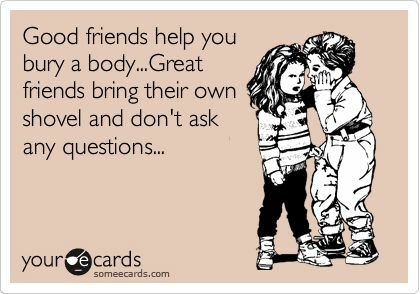 I refer to her as my “bury a body buddy” but that’s a story for another day. Her sweet boy, Adam, was home sick from school! I adore this little man, and I was immediately distressed that he was sick… but I must admit it was immediately followed by excitement! I can make my chicken soup! 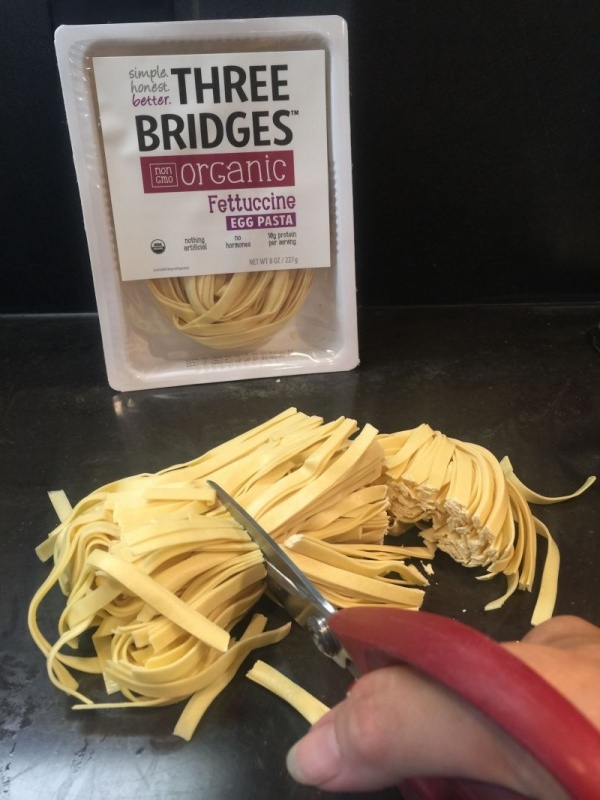 I promise you, that after you make this just once, you will make sure you have all FOUR of the ingredients on hand all the time. 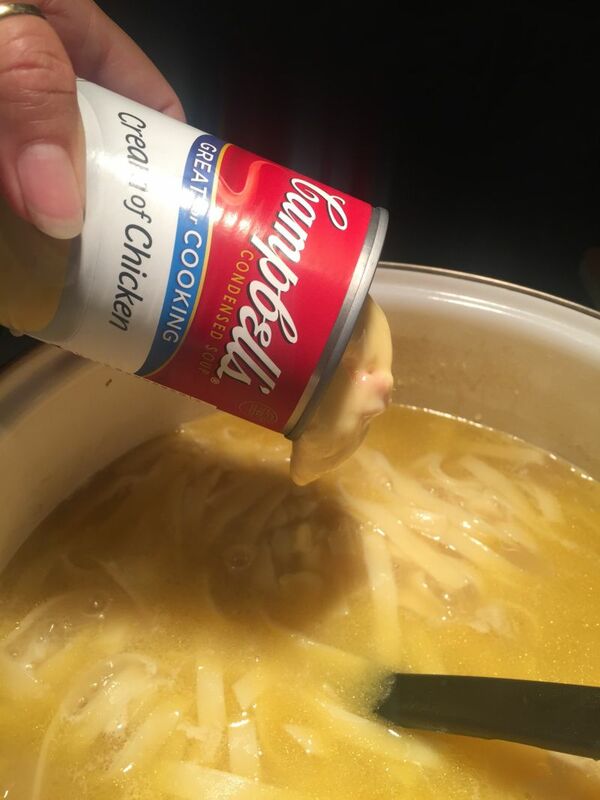 That’s right…only FOUR INGREDIENTS! Whenever I buy a chicken, whether it’s a whole chicken or parts, I wash them. No kidding. I use soap. Back when I was a youngster in nursing school, we tested a fresh chicken from the store and cultured the surface of it. Then we did the same thing with a chicken that we washed with soap and water. I will not go into detail the bacteria that grew on the store chicken, or what it was, but suffice it to say I always wash my chicken now and I strongly encourage you to do the same. 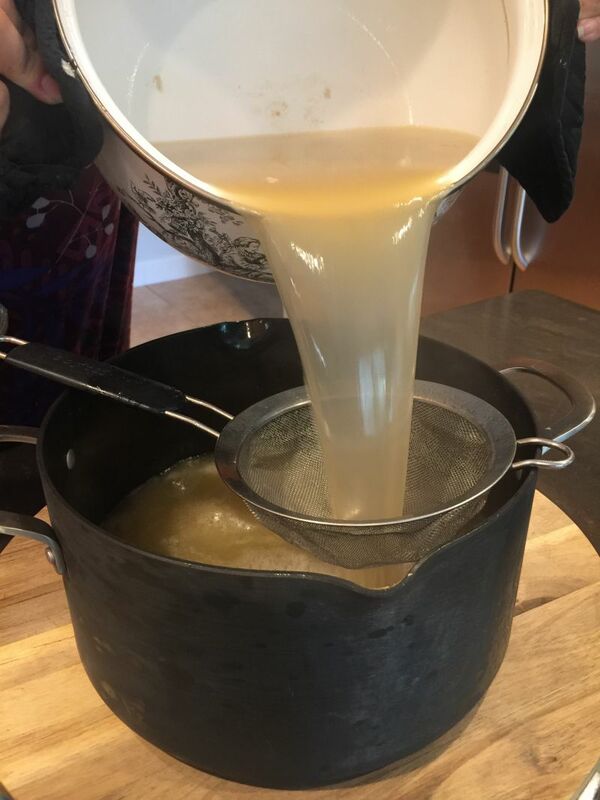 I use the pump soap in the kitchen, lather it up, and rinse it very well. 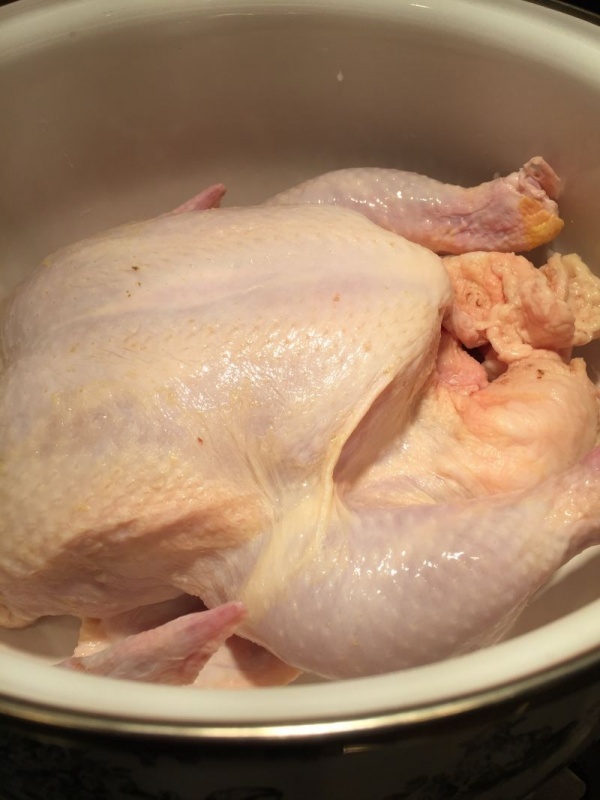 After washing the chicken, pop it in a large pot and cover with the chicken stock. I have mentioned before that Costco makes my favorite Chicken Stock, and I honestly purchase it by the case! Bring the chicken and stock to a boil, then turn down the heat and gently boil for an hour. The chicken will be cooked and the meat will start falling off of the bone. Remove from the heat and using tongs, remove the chicken and all the little chicken pieces to a separate bowl to cool. 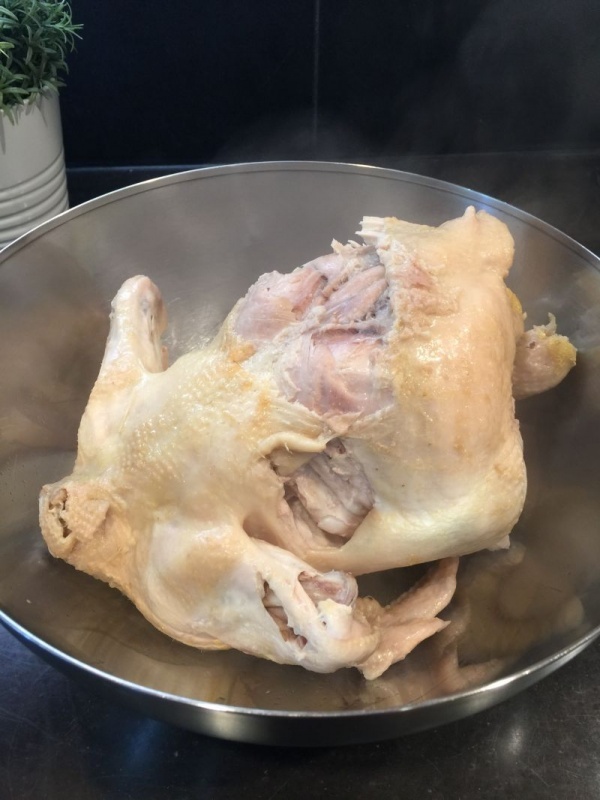 While the chicken is cooling, strain the broth from the pot through a metal strainer and into a large pot or bowl. This removes all the little fatty pieces and funky little gray pieces from boiling the chicken. Wash the pot to remove any residue from the sides of the pot, and then return your strained broth back to the pot. As soon as the chicken is cool enough to handle, remove all the meat from the bones. Discard the bones, skin and any gristle pieces that are unsightly. You only want beautiful chunks of chicken. 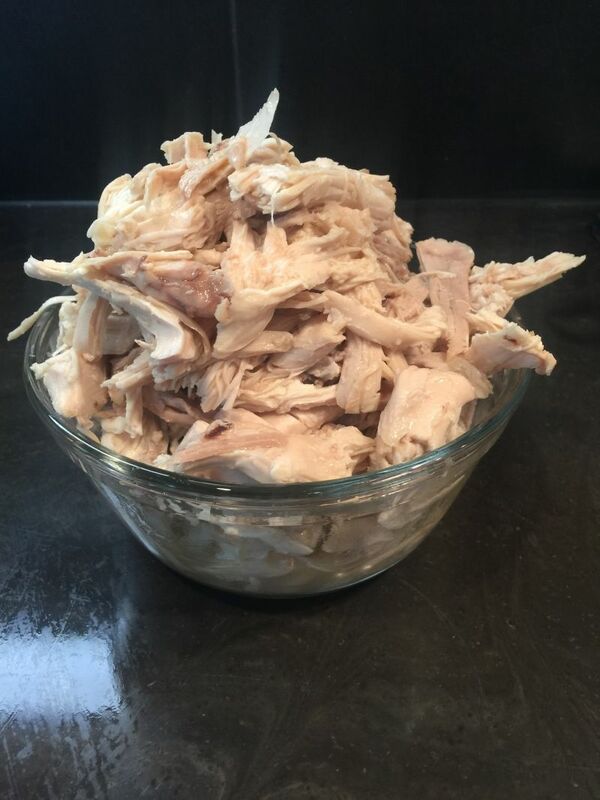 Tear the chunks of chicken into bite size pieces. Set aside. After the noodles have cooked, turn the heat to simmer and add the can of undiluted cream of chicken soup. 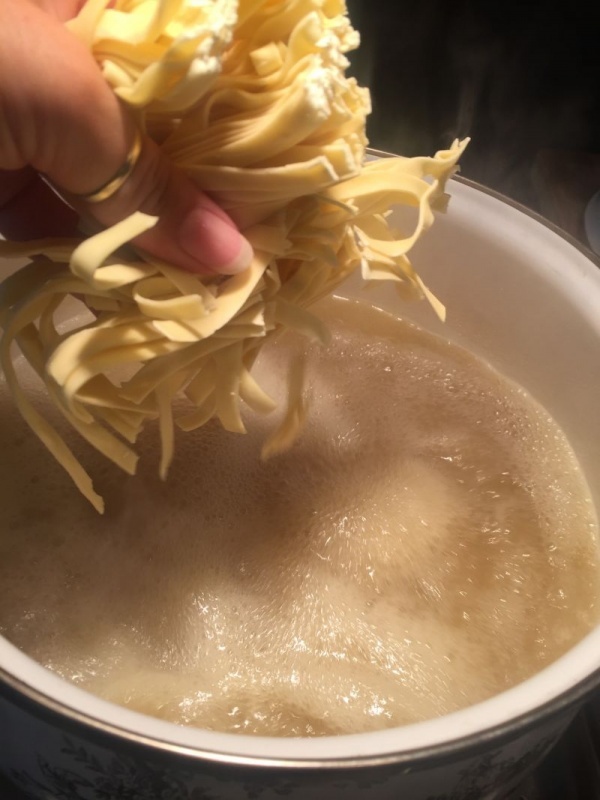 Stir gently to nicely blend with the stock, while being careful to not tear the noodles. 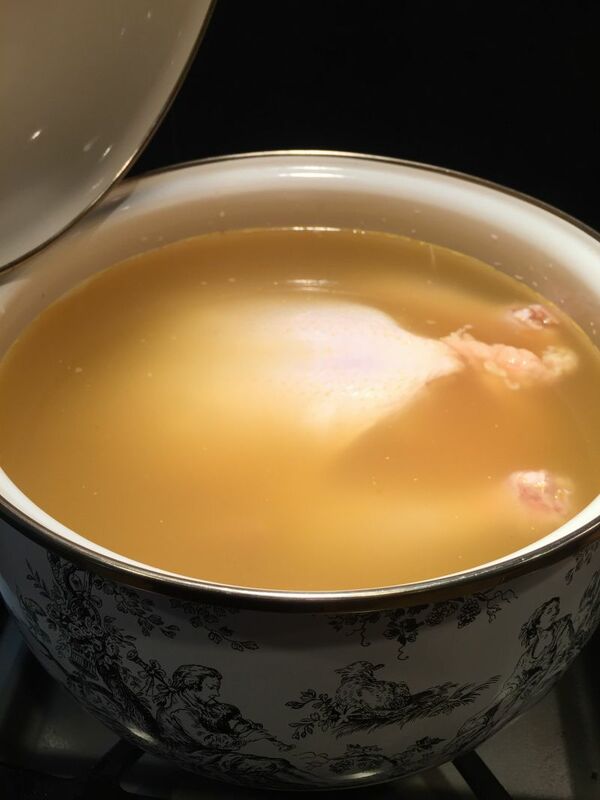 Once the stock is creamy and there are no “lumps” of cream of chicken soup, add the chicken meat back to the pot. Stir gently. P.S. This recipe can be used to simmer the carcass of the turkey after Thanksgiving. 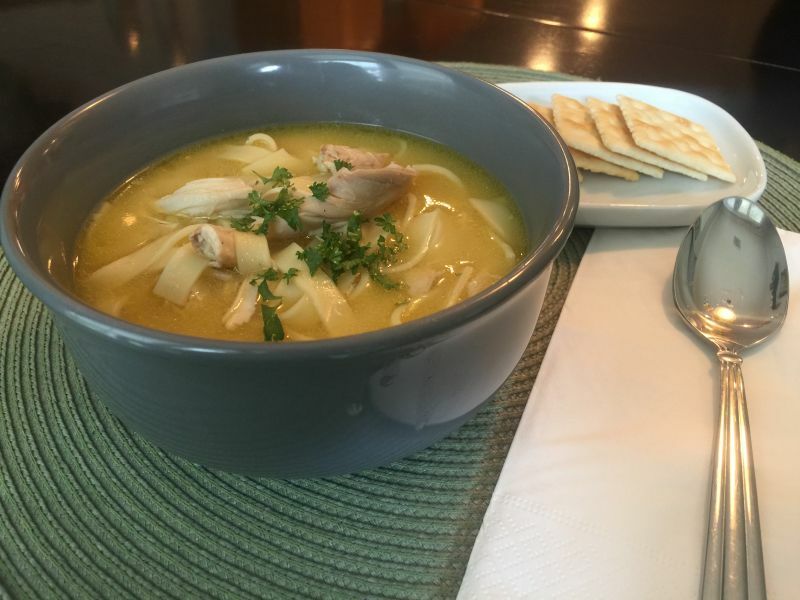 There is more than enough meat left on the turkey to make a beautiful turkey noodle soup! Hope the soup did the trick and he feels better!